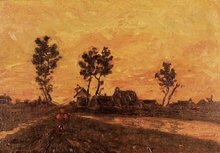 Showing the beautiful hues of multi-coloured wheat fields during sunset, this is probably one of the most vibrant paintings done by Vincent Van Gogh. 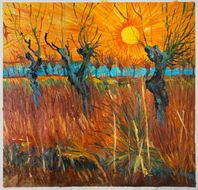 After studying Van Gogh’s complicated technique for years, our painters have perfected the skill, and they can provide the most original-looking reproduction of Sunset: Wheat fields near Arles. Their motive is not to copy the painting, but to encapsulate its soul. 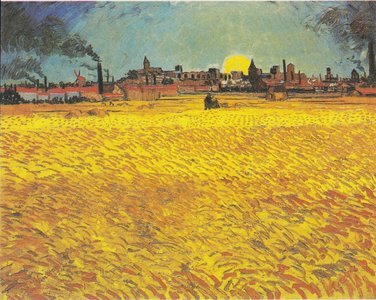 In one of the letters to his brother Theo, Van Gogh wrote that he wanted to capture the glaring summer sun against the golden wheat fields of Arles. 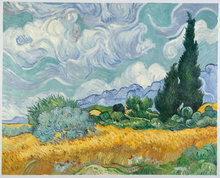 Since Van Gogh made this painting during the height of mistral winds, it was very difficult for him to keep the canvas stationary. So, he decided to first drive the easel into the ground and then secure it with a rope. 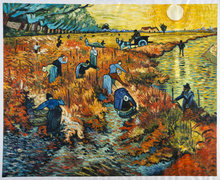 While Arles was primarily an agricultural town, industries were slowly coming up in the late 1880s, and that can clearly be seen with the chimneys in the painting. Why accept posters or prints when you can add complexity to any room with an attractive and affordable oil painting? 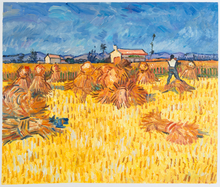 For example, the color yellow in the painting reverberates the other colors that are found in a room’s furnishing.